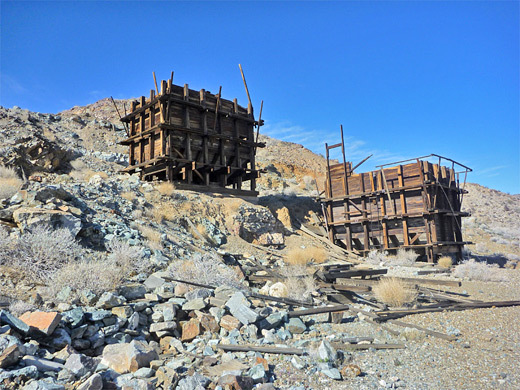 Old mines are only an incidental attraction of Joshua Tree National Park, but there are plenty of them, in various states of disrepair, and they are usually accompanied by stark, desolate surroundings, yet most are easily reachable by trails, that follow the old vehicle tracks once used by the prospectors. The park apparently contains 288 historic mining sites and 747 openings. Only a few of the paths are maintained (such as to Lost Horse Mine and Desert Queen Mine) but most are straightforward to follow, and many of the mines are quite close to paved roads, such as three in the lower elevation, southern section of the park, near the popular Cholla Cactus Garden. These are Silver Bell (also known as Golden Bell), El Dorado and Golden Bee, of which the first two may be visited on a loop hike of 4 miles; up a slope to the first site, which includes shafts and two well preserved tipples (wooden structures used to load ore into carts), then down the far side and over an intervening ridge to the second site. 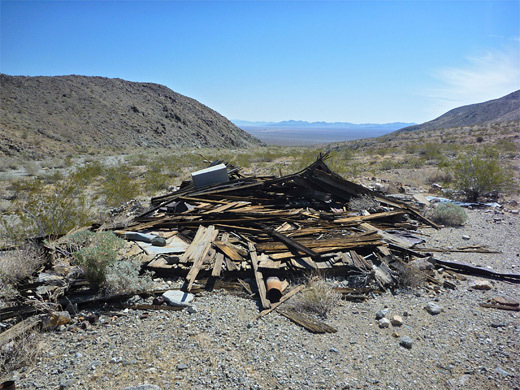 This has a variety of iron and concrete relics, plus remains of a miner's camp, including old shacks and hundreds of rusty tins. The hike also encounters a good variety of cacti, and the higher sections of the route have fine, long distance views over Pinto Basin. The old track to the second mine (El Dorado) is now faded and difficult to locate, so the majority of the loop is essentially off-trail, but the terrain is relatively easy, the desert vegetation quite well separated. 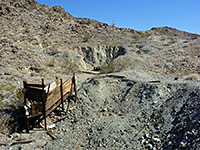 Golden Bee Mine is best reached by a separate hike, of 1.5 miles, due south from Cholla Cactus Garden. 18 views of the two mines. Parking for the hike is at a pull-out on the south side of the park road, 2 miles west of Cholla Cactus Garden. An information plaque gives a brief history of Golden Bell Mine, the tipples from which are visible near the top of the low ridge to the south (half a mile away), but the mine is not promoted as a hiking destination. The old road to the mine is also in view, crossing the hillside, although the road doesn't lead to the parking area, so the first part of the hike is cross country, over nearly level, stony, alluvial ground, where small ridges are separated by many little streamways, soon intersecting the track at the base of the hills. 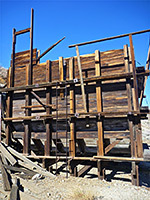 This climbs 250 feet to the two tipples, which are not fenced off, and seem still to be quite sturdy, constructed of thick timbers now weather-aged to a dark rust color. A metal ladder leads to the top of one of the tipples. The surrounding rocks are quite obviously mineralized - generally reddish, with many flecks of blue and green ores. A little summit just above the tipples gives good views of the surroundings. A faint path contours southeast, on the south side of the ridgeline, to the mine site; over a steeply sloping hillside with some loose rocks, round a basin and past two shallow shafts, both loosely fenced. Just beyond is the main mining area, which includes a wooden hopper and at least two much deeper shafts, sealed more securely by iron bars. Several other iron and stone structures remain, plus many little test excavations, cut just a few feet into the bedrock. 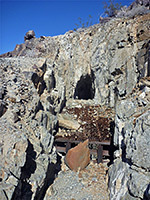 The mine was in operation from the 1930s to the 1950s, producing a mix of copper, gold and lead, though not, it would appear, any silver. A gully leads down to the sandy wash on the south side of Silver Bell Mine, which opens out a little way east. 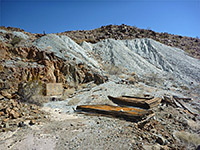 El Dorado Mine is situated in the next valley, about half a mile further south, reached by heading downstream a way, up a little side ravine and over a ridge. 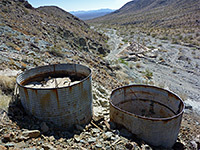 The most visible relics here are two circular concrete tanks, beside a blue-tinged spoil heap (containing cyanide minerals), together with other foundations and iron debris, all appearing rather more recent compared with Silver Bell Mine. The old access road is evident as well, climbing the hillside to the north. Just above the wash on the far side of the valley are several collapsed wooden shacks, originally living quarters for the miners. Near here are piles of glass fragments, iron cans and other detritus. 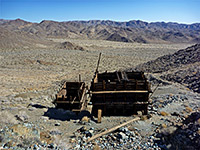 El Dorado Mine produced a wide range of metals and ores, including gold, vanadium, galena, molybdenite and wulfenite, and was active from around 1900 to the 1940s. The route back from here can be the same as the approach, but an easier option is to follow the valley east until the hills recede, then head north and later northwest, round the foot of the ridge and cross country back to the parking area.